How to Quit Caffeine – painlessly! There are numerous reasons why a person decides to quit caffeine. You may have been advised to quit by a health professional; you may be pregnant or breastfeeding; you may be training for an elite athletic event where caffeine is prohibited. For many people, caffeine is simply a daily habit with an unnoticeable effect on their daily life. It’s easy to forget that caffeine is an addictive drug – and as anyone who has suffered through caffeine withdrawal symptoms can testify, there can be very unpleasant side-effects. Attempts to quit coffee can be discouraging if you don’t know the right way to do it. Many people’s lifestyle habits are built around the ritual of brewing their morning cups of coffee to wake up plus relying on an afternoon pick-up cup and maybe even an evening cup to stay up late. Unfortunately, painful and debilitating caffeine withdrawal symptoms can keep the habitual coffee drinker from following through with the best of intentions to quit coffee. 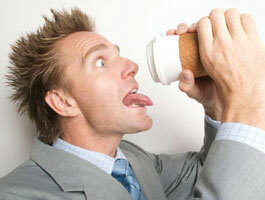 Pounding caffeine withdrawal headaches can propel coffee drinkers back to the coffee cup to get respite. If you follow Teeccino’s Kick the Caffeine Habit Program (below) by weaning off of caffeine over a two week period, you can avoid the symptoms of caffeine withdrawal. A coffee drinker has to satisfy four needs to make the transition happily to a caffeine-free coffee alternative. With over 15 years experience helping people wean off of caffeine, we are happy to tell you that Teeccino Herbal Coffee fulfills all 4 needs of coffee drinkers and makes caffeine withdrawal pain-free and – Yes! – enjoyable. Thousands of Teeccino customers who no longer drink coffee have used Teeccino’s Kick The Caffeine Habit Program to successfully quit coffee. You can follow this program and be successful too! The goal of Teeccino’s Kick The Caffeine Habit Program is to help you gradually wean yourself off of caffeine giving your body enough time to adjust to less and less caffeine daily. This gradual caffeine withdrawal program will help you avoid the unpleasant symptoms caused by a sudden precipitous drop in caffeine intake. Teeccino’s Kick The Caffeine Habit Program is based on blending Teeccino with your regular coffee in gradual amounts over a two to three week period that can be adjusted on an individual basis. If you want to drink ready-to-go brewed coffee at a café or at the office, we recommend you carry a thermos of brewed Teeccino that you can blend with coffee in the cup. Additionally, to make it easy to brew Teeccino when you’re on the go, we offer a number of brewing options including Teecino teebags that make it easy to brew Teeccino with only boiling water and a cup. Many people find their adrenals are exhausted after habitual caffeine intake. Other organs may need some help getting back to normal too. We recommend a number of herbs and nutritional supplements that help restore adrenal health so you can rebuild your natural energy supply more rapidly. Try them for a couple of months to get their full effect as dietary supplements need time to produce their full benefits, rather than just the short-term effects you get from over-the-counter drugs.